Scientific romance, or post-Cold-War thriller colliding with the new war on terrorism? If only Adrian Wells could be sure what kind of story he was caught up in. 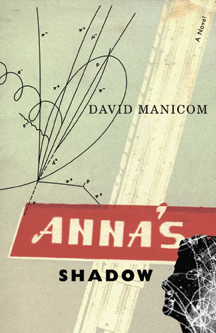 The Shadow Photon is set in the terrorism-haunted North America of 2007, in Siberia, and in the chaotic gloom and unexpected beauties of early '90s Moscow. It is a story of politics, science, and the uncertain border between love and desperation. Soon after the collapse of the Soviet Union, a young diplomat named Adrian Wells encounters Anna Mikataev, a particle physicist. Anna has discovered how to carve light to manipulate the paths of one of the building blocks of reality: the photon. In the small basement room where Anna Mikataev lived, the force fields of sub-atomic particles, individual lives, and the politics of terror all meet. David Manicom is the award-winning author of seven books. Progeny of Ghosts: Travels in Russia and the Old Empire was the Quebec Writer's Federation's non-fiction book of the year and was shortlisted for the national Writer's Trust Viacom award for non-fiction. His most recent poetry collection, The Burning Eaves, was short-listed for the 2004 Governor General's Award for poetry. In 2005, he published his first novel, The School at Chartres [Oolichan Books]. He has published fiction, poetry, non-fiction and journalism ranging from book reviews to political commentary. A Canadian Foreign Service Officer, he has worked in Moscow, Islamabad, and Beijing, and currently works in Geneva.